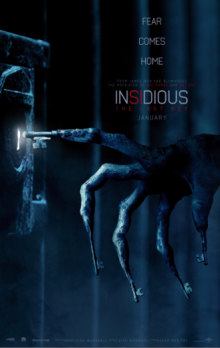 The creative minds behind the hit Insidious trilogy return for Insidious: The Last Key. In the supernatural thriller, which welcomes back franchise standout Lin Shaye as Dr. Elise Rainier, the brilliant parapsychologist faces her most fearsome and personal haunting yet: in her own family home. The film is written by co-creator Leigh Whannell (Saw), who wrote the trilogy and directed Chapter 3; produced by Insidious regulars Jason Blum (The Purge series, Get Out), Oren Peli (Paranormal Activity) and co-creator James Wan (The Conjuring, Furious 7); and directed by series newcomer Adam Robitel (The Taking of Deborah Logan). Shaye is joined in the cast by Angus Sampson, Whannell, Josh Stewart, Caitlin Gerard, Kirk Acevedo, Javier Botet, Bruce Davison, Spencer Locke, Tessa Ferrer, Ava Kolker and Marcus Henderson. Join LatinoScoop at an exclusive advance screening of INSIDIOUS: THE LAST KEY in select locations below. Click on the link below for your city and enter the code. If you download a screening pass and aren’t able to use it, please share it with someone who can attend. There are limited number of passes available for each location. Screening passes are available on a first-come, first-serve basis. Additional passes will not be added once they are all redeemed. All advance screenings will take place on Tuesday, December 19. Anyone downloading a screening pass is advised to arrive early to secure seating. The theater is intentionally overbooked by the studio to ensure a full house. Plan accordingly to arrive with enough time. All advance screenings below will take place on Tuesday, January 2 at 7:30PM.